CodeTwo, an award-winning provider of MS Exchange and Outlook-based software solutions, today announced the debut of CodeTwo Public Folders 5. 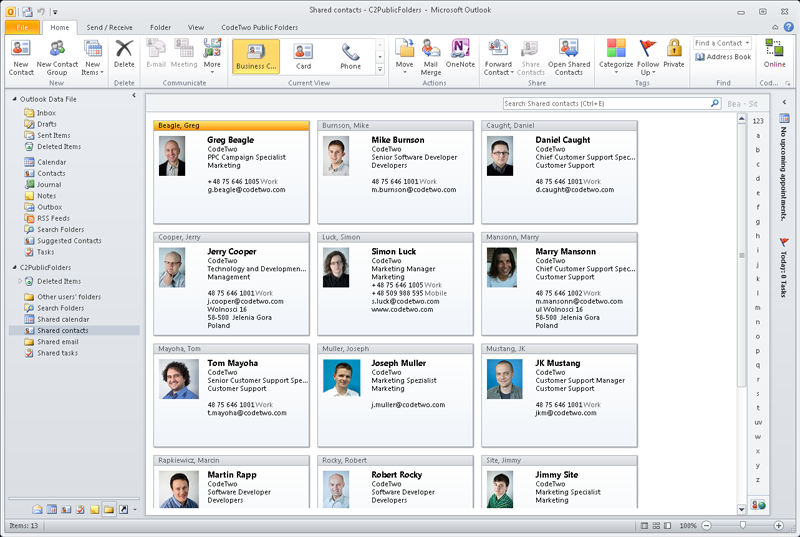 Among several new features (see below), the updated product includes a new kind of file sharing and sync – “direct link” – that lets business professionals share Outlook items (calendars, contacts, tasks, notes, email) and any Windows file across a local network or via the Internet without using external servers. It’s a much safer and easier way to share and sync files without the security risks of the traditional cloud. Traditional business cloud software solutions have several disadvantages. They can be expensive, and often require I.T. knowledge and/or network administrators to implement and maintain. They also store data on external servers, increasing the security risk of data being lost or tampered with due to unauthorized access. In contrast, CodeTwo Public Folders 5 is a safer “direct link” solution, since it bypasses external servers and stores, shares, and syncs encrypted data only on local computers. Safe Internet Sync – Outlook or Windows files can now be safely synchronized via the Web without using external cloud servers. Data is only stored and synced on local computers, providing better protection from loss or unauthorized access. File Sharing App – Any Windows file can be shared over the Internet without storing files on external servers. Shared Data Encryption – Every synchronized file is always fully encrypted when being transferred between computers. Improved Security – Client Apps now have native password authentication. If present, users can also use the Active Directory logon. Sync public folders with iCloud – CodeTwo Public Folders 5 is now compatible with CodeTwo Sync for iCloud, which means users can view and keep Outlook shared folders in sync across iOS devices (iPhones and iPads). Better Design – New Outlook icons and administration panel windows. Create and share public or personal folders – Share personal Outlook folders or create and share public folders that work similarly to Microsoft Exchange Server. Real-time, automatic syncing – No need to click. 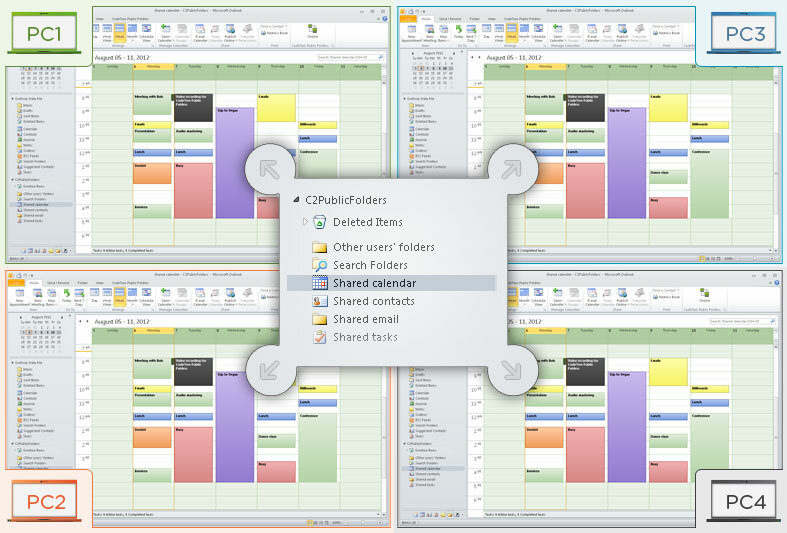 Selected folders are automatically synchronized in real-time. Work online or offline -- Since files are stored on local computers, users can work offline without an Internet connection. All content changes are updated when users return online. Sync Outlook custom forms and views -- Teams can synchronize custom Outlook forms and views to help increase efficiency and ensure everyone has the same workflow. Administration Panel -- Manage access rights, backups, licensing or restore removed items from the convenient admin panel. Fast set up, easy to use – No need to learn new software. Set up in minutes on Windows PCs. No servers or high-level technical expertise required. More information about CodeTwo Public Folders can be found here. Users can download a completely functional, free 30-day trial of Public Folders here. Pricing starts at a one-time fee of $160 for the Base Package of three licenses and one Syncing Master. An additional fee for Internet synchronization starts at $48 with three computers for a 12-month license, renewed annually. Full pricing details can be found here. CodeTwo is a worldwide leading developer of MS Exchange Server and Outlook-based software solutions. CodeTwo's enterprise and freeware applications are used by millions of users worldwide, including customers like Unicef, L’Oréal, Shell, UPS, Toshiba, Fujifilm, Casio, and Mitsubishi. A Microsoft Gold Certified partner, CodeTwo’s award-winning products have received high praise from sites like CNET, Tucows and MSExchange.org among others. Founded in 2007 by Michal and Jarek Bednarz, CodeTwo is headquartered in Jelenia Gora, Poland with customers in North America, Europe, Australia, and Asia. For more information about CodeTwo, visit http://www.codetwo.com.